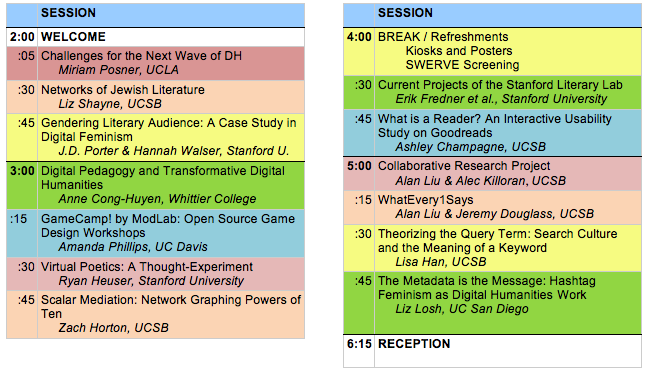 We are thrilled to announce our #SyncDH schedule for Friday, May 8th. The slam will run from 2p-6:15 in South Hall 2607, 2623, 2635 (CRC, Sankey Room, conference room). Please see our SyncDH Flyer and SyncDH Schedule. Video embeds and links for the live event are below! Miriam Posner, Liz Losh, Anne Cong-Huyen, Amanda Phillips, Stanford Literary Lab visiting scholars, and UCSB faculty, graduate and undergraduate researchers!